Geometric dimensioning and tolerancing (GD&T) has become accepted around the world as the international symbolic language that allows engineers and machinists to use engineering drawings to communicate from the design stage through manufacturing and inspection. Its advantages are uniformity in design practice, ensured interchangeability, consistent interpretation, and maximum tolerance allocation. With GD&T, design requirements can be specified explicitly and the latest gaging techniques can be accommodated, contributing to higher productivity and less rework and scrap. 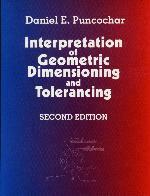 Deductively organized, this book is a complete on-the-job reference that provides a thorough understanding to the complex ASME Y14.5M-1994 "Dimensioning and Tolerancing" standard. Uses a "building-block" approach with examples (some dimensioned and toleranced in inches and some in millimeters) to illustrate each concept. Reinforces the explanations with end-of-chapter self evaluation exercises (the answers to all questions and problems are contained in the back of the book). Includes over one hundred drawings that illustrate concepts under discussion. Provides the information needed to become conversant in the techniques of GD&T and how to smoothly integrate this knowledge into engineering design and modern inspection systems. Introduction. Symbols and Abbreviations. Datums. Feature Control Frames. General Rules. Form and Orientation Tolerances. Virtual Condition. Tolerances of Location. Practical Applications. Appendices: Past Practices, Plus/Minus Positional Tolerancing, Symbols, Glossary. Answers to Questions.